Can gerrymandering by biased humans be replaced by the objective commands of the computer? Kevin Baas, a City of Milwaukee programmer, believes it’s possible, and has devised an intriguing solution he has already submitted to the Florida legislature to solve a dispute over redistricting. The problem he sought to solve is suggested by results of the 2012 Wisconsin state assembly elections: Democratic candidates received 53.5 percent of the statewide vote and yet won only 39 percent of the seats. This came in the wake of the 2011 redistricting effort, which was undertaken by members of the GOP-controlled legislature. Opponents have called this one of the most gerrymandered states in the U.S. and have argued that Republican legislators used the redistricting process as a chance to enhance their majority — both by “packing” Democratic voters into fewer districts, and also by “cracking” remaining Democratic areas into small pockets of Republican-dominated districts. Once started, the program takes an initial map, copies it numerous times, and then experiments by trading election wards between districts. Each mutated map is then scored in terms of specific criteria having to do with geography and fairness. The program then rejects the worst maps, and continues to recombine the best ones. Baas says his program produces maps on the order of hundreds per second, continually scoring them as it goes. On the left is the current seats/votes curve for Wisconsin’s Assembly Districts. It shows a partisan advantage for Republicans in terms of translating votes into seats. This advantage is illustrated by the darkened red area in the middle of the curve. On the right is a curve generated by the application which would result in significantly more competitive elections. In addition to the geographic assessments, Baas’ program includes four measures of fairness: proportional representation, voting power balance, total wasted votes, and the asymmetry between seats and votes in each district. Proportional representation is defined as the deviation of the number of elected seats for a party from the distribution of the popular vote. Voting power balance is a measure of the competitiveness of elections in a district, determined by how unpredictable an election result is. “Wasted votes” are a way of describing votes that do not contribute to the overall outcome of an election (because too many Democrats or Republicans are packed into one district). In Baas’ program, wasted votes are defined as all votes for a winning candidate above the amount needed to win, added to the total number of votes for any losing candidates who received less than half the number of votes needed to win. The asymmetry between seats and votes in each district is a measurement of how easy it is for a party to convert votes into legislative seats. The overarching goal of the fairness criteria is to try to make districts that are equally competitive, and where the outcomes of elections most closely match the popular vote. The software has an adjustable setting where users can decide how strongly each of the four fairness factors and three geographic criteria should weigh into the creation of the districts. For example, if minimizing wasted votes is less of a priority to the user than creating compact districts, the settings on each of those factors can be adjusted accordingly. The program can also assess the quality of previously drawn electoral maps, scoring them in terms of the geographical and fairness criteria. David Canon, also a UW-Madison political science professor, notes “the program treats all of these factors as equal, whereas the law requires that equal population and the Voting Rights Act are satisfied first, and then the other dozen or so redistricting criteria can come into play.” Democratic Assemblyman and redistricting consultant Fred Kessler stresses the importance of understanding the historical, ethnic, socio-economic, and religious contexts of each district when making electoral maps, something even the best computer program would struggle to do, he believes. McDonald suggests using a combined approach. “Human brains work much differently and can often see patterns that computers have difficulty identifying. Automation may be a way to constrain a redistricting authority, but I would have automation be a base map from which a commission might further deliberate. I would also open the process of offering counter-proposals to the general public, since no one – even a computer – has a monopoly on what constitutes the best plan.” He says Mexico uses a computer algorithm to create a first draft of federal election districts, as a basis upon which officials then negotiate. Despite the controversy, Baas argues the software’s potential benefits are undeniable. Because it is open-source Java software, its inner workings are open to careful scrutiny. He submitted the program to the Florida legislature for consideration after the Florida Supreme Court ruled that as many as 22 gerrymandered districts there needed to be redrawn. He hopes others will take notice. Kevin, impressive work! This is definitely a huge problem and this is an interesting solution you’ve come up with. My biggest concern though is that the criteria for proportional representation, voting power balance, and total wasted votes might be skewed by the fact that some people elect to not vote in their district because it’s already be gerrymandered. Thus throwing off the data. Wasted votes would certainly be skewed by turnout. Nonetheless, by using the data, skewed as it is, you’re still pushing the map in the right direction – making it more competitive – so presumably fewer people will elect to not vote next election. So you get progressively better. I have looked at the minority representation scores – you can actually use the program to get those stats – and as one would expect, the auto-redistrict map scores much better. I’m going to add that into the program. Right now I’m adding reporting on it in the stats, then I think I might add it as a fairness critieria. I just deployed a new revision, that shows minority representation in the stats panel. There’s now ethnicity populations and percentages in the “by district” table. 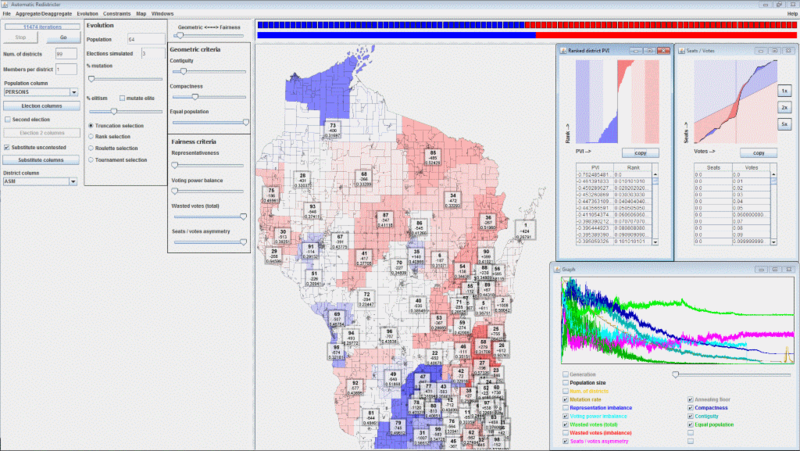 The particular example in the screenshot is a multi-winner election ( http://www.fairvote.org/reforms/instant-runoff-voting/ ) map i auto-generated for fairvote.org. in the current wisconsin assembly districts the black ethnicity has over twice (200%) the wasted vote rate as the average citizen – so currently our assembly elections are totally packing the votes of african americans. the auto-redistrict map is way better – blacks turn out to be a slight 3% BELOW average wasted vote rate. The program does NOT treat all of these factors as equal, it leaves it up to the user how these factors should be weighted. They can adjust the weightings in real-time. Wouldn’t (shouldn’t?) the number of wasted votes theoretically be reduced over time by voters who feel more empowered? I can only imagine that with gerrymandered districts those votes have increased…on both sides of the isle. By the way, nice work taking a scientific approach to this issue! Too bad science is being phased out in this state! remain to be seen no more – I’ve just implemented this in the latest release (1.12) you can see a screenshot on the website. I’ve just got to move some code from the stats panel to the DistrictMap class and then add it to the scores vector and a corresponding slider to the UI. I estimate maybe two or three hours of coding until it’s on par with all the other optimization criteria. Basically what it’ll do is minimize any discrepany in how much one ethnicity is packed vs another. Pretty straightforward, actually. Once you have the data – which they don’t use when they do it manually so i fail to see how they can even pretend to meet the VRA criteria with a manual approach! But I digress, point is – “The most controversial aspect” is going bye-bye. What’s the problem? Gerrymandering is wrong and deceitful. districting by population is the way the country should be run. It is the only the people are represented fairly and would making voting people would look forward to do to instituted change. Corporations shouldn’t be considered a voter because they buy votes and the lawmakers. This is a no brainer unless you are part of the corrupt process that insures reelection not representation instituted by the constitution. Kevin, this sounds like a great attempt to use technology to replace gerrymandering. Florida may be forced to at least look at it, but as Tim Cullen speculates, Wisconsin will likely fight it unless it’s imposed by the U.S. Supreme Court. You may be an ignored prophet in your own state, but legislators (and courts) in other states may not be as dead-set on rigging the system at all levels of government. Sure, trust some programmers with redistricting cause the Left is whining that the GOP did what they did under Earl. Garbage in, garbage out in this deal. WCD your logic is insanely idiotic and nonsensical. “Democrats did something bad 50 years, therefore they are whining today about the GOP doing something bad.” Meaning what exactly? A 4 year-old knows that two wrongs don’t make a right and somehow you don’t. WCD, I don’t want anyone to trust me, on the contrary, I want them to look at the source code and make sure that there aren’t any bugs. That’s why it’s open-source. So that nobody has to trust – everyone can see every single line of code. Contrast this to human map drawing where you really do have to trust cause you can’t see inside their heads. I wrote the software so that people didn’t have to trust; didn’t have to rely on faith. And even you, WCD, are invited to look at the source code. It’s hosted on GitHub and included in every release (and that’s legally required by the license), and there’s a link to it on the site. John, the problem with districting by population only – well, 2 problems, firstly that would look like television static – (does everyone still know what analog t.v. looked like, or am I getting old? White noise. Like white noise.) you need to add in that districts must be connected. But now you just went from static to spaghetti. You got to add in anothe criteria of geometric compactness. Otherwise you get sphagetti districts. But I imagine that’s what you really mean – just those 3 geometric criteria. Well now the problem with that is that to say that’s neutral is to assume that that sort of partioning doesn’t amount to selecting for a particular demographic. This is equivalent to assuming that demographics are homogenously distributed (spatially). However, this assumption is false. Because demographics are influenced by in-person communication and travel, which are limited spatially, they tend to be spatially self-sorting. and what you get is aggregations into pockets. In particular, liberals tend to be highly concentrated in urban areas, and conservative dispersed in rural areas, that are closer to an even mix of liberal/conservative. The consequence of this is that a purely geometric approach will have a natural effect of packing democratic voters, but not so much republican voters. So far from being neutral, this effectively amounts to a partisan gerrymander. This is described and analyzed in much greater detail in a paper I link to on the “resources” page of the autoredistrict website. It’s the reason why you really do have to use the election data to create fair districts — because you have to neutralize this natural packing effect. Kevin, wow, this could be revolutionary. Or simply a fulfillment of the best intents of our Constitution’s framers (which took some centuries to be fully implemented). Thanks for your dedicated efforts and commitment to open sourcing. Let’s hope technology, transparency and fairness can triumph over politics. As regards Fred Kessler’s concerns, I would argue that you don’t news to know a detailed social history, and in a certain sense, you shouldn’t – your primary concern should be with the first amendment – equal voice, which means equal voting power. And this can be measured quantitively much better than a human could estimate it subjectively – provided, of course, that the data is made available in usage format. At the end of the day the issue is one of degree: how objective one is, and how much relevant data has ones included. Well, that, and one of logic: has one processed this information correctly? I don’t think Kessler’s arguments addres these issues. He certainly presents some of the questions. But I don’t see any where where he provides a good strategy for answering them. You plan to get this past the constitution?? Do not think so. @WCD : oh no my plan is precisely the opposite: to have everyone’s voice treated equally. The first amendment of the constitution – in the bill of rights. Point in case – if anyone thinks they understand the mathematics of this better such that they can implement it better, they are welcome to do so, and let the world be the judge. Furthermore, I will help them. I have helped them. I’ve offered them my code as a starting point, if they think it worthy. I believe that, at the least, is a right guaranteed to me by said constitution. Also, WCD, I kind of don’t get what you’re saying. “You plan to get this past the constitution? ?” You do realize that this program is designed to PREVENT gerrymandering, right? While the constitution falls short of explicitly granting the right to vote, it does say that at least national congress should be determined by elections, and that the representatives of the house should represent equal population. Then there’s the equal protection amendment. Thats what the program DOES. There’s nothing to “get past”. It sounds like you feel the need to “defend” yourself from “fair representation”. “What? You want to make sure my vote gets counted?! How dare you!” I can’t begin to explain how idiotic that sounds. Constitutions spell out how to reapportion and it is doubtfull that anyone will allow or accept it done by any machine that can be hacked by anyone. Just like VAT, a little change means everything. Who will trust anyone to program it. Nevah hoppen!!! You really don’t understand anything that’s been said. WCD: As has been explained multiple times, it’s Open Source Software. Also you do realize that re-districting isn’t done with chalk. It’s done with computers and software. Big News: Challenge to Wis. gerrymandering may be allowed to proceed. Great work, Kevin, with awesome potential. I guess sometimes machines can be fairer than humans — at least when smart humans are behind the design. But therein lies the catch: “when smart humans are behind the design” … of the machines. But hasn’t that always been the case? The difference now is visibility — that we all can see and contribute to the inner workings of the machine. whomever programs the machines will have the power. For anyone interested, I’m going to on Wisconsin Public Radio to talk about the software tommorow at 2pm. Schedule here: http://www.wpr.org/shows/fixing-wisconsins-heavily-gerrymandered-districts. They have a live stream, just google wpr live. @WCD Open Source means no secrets. Anyone can run the program. Anyone can verify their results. Anyone who knows programming can compile the source code. No one controls the machine. Each political party can verify for themselves. @AProgrammer: That may be one reason why those wanting to rig the system will fight this approach to redistricting. Why would they want transparency? This has been fun debate. Me against 20-30 of you is pretty even. If you have opinions but no knowledge, you will always lose. The Left has no knowledge of logic. Finally this is never going to happen as machines can be fixed by those who make them and run them look at VW and their shenanigans with mufflers. Never pass as constitutional amendment. Am disappointed in Bruce, not being able to research something as big as a reapportionment by Tony Earl and then refusing to admit it after I give him the info and the governor attests to my accuracy. On the contrary WCD, I would argue you completely ignored or were incapable of understanding what most people here were asking of you. The pending request for the U.S. Supreme Court to look at Wisconsin’s redistricting may have some impact on this, if they choose to hear it. Being the most unequally gerrymandered state is not a distinction we need, in addition to being known for having the “most bought” state Supreme Court. Even though some are fine with corruption, esp. if it benefits them, it does not produce a positive economy and productive state in the long term. You have opinions but your lack of knowledge, history the law, constitution makes your opinions worthless. I presented the facts, backed up by Tommy and the research of Rob Hutton naming the dem deed in 1983. Settled law. Anyone can bloviate, as most of you do. You are entitled to yoru own opinions but not your own facts. We have positive economy now, schools have more teachers now then before ACt 10, jobs are up instead of down, Milwaukee dragging everyone down with crime, bad schools, human trafficking, heroin/fentanyl, corruption, bad roads, lousy county , youth unemployment 57%, worst poverty, kids cannot read in third grade worst managment. @WCD – “Finally this is never going to happen as machines can be fixed by those who make them and run them look at VW and their shenanigans with mufflers” The code in VW’s was what’s known as proprietary or closed code — the opposite of open source. Closed code is treated as a trade secret, It isn’t public, kind of like our voting machines. Anyone with access can do whatever they want and no-one will ever be the wiser. On the other hand, if you can run the posted source code — on your own machine — please explain how anyone can pull a fast one. This programmer with 10+ years professional experience would like to know. If you can build a machine, somemone has to program it and someone will be able to get into it. Will never pass an amendment anyway so why other to debate something that will never happen, like changing the electoral college. I would expect a geriatric know it all to not understand what open source coding is. Please use Google to look it up. WCD, where are your facts that state Milwaukee is alone in the increase in Heroin usage? It’s exploding everywhere, with the greatest increase in rural counties. @WCD Yes, I can build a machine. The point is: You (or someone you trust) can build a different machine. Then someone puts the publicly available source code on both machines. Both machines will run the same instructions, producing the same results. With public software code anyone sufficiently skilled in the art (read millions of programmers) can review and run the code themselves. There is no-one to trust. Everyone can check everyone else. As to the US Constitution: Nothing in the Constitution to prohibit any means of selecting Representatives (mostly a state matter). No one will ever trust it, will not happen, will never pass constitution, so why debate. but you are right about Heroin, have worked on this fro over 50 years, remember “man with the Golden arm” in 50’s, worked in Rehab in nursing home operation with 5,000 beds and would be considered one of the top pharmacist experts on heroin addiction. It is all around state and very bad. it should be priority cause treatment does not work, Like AAA. Prevetnion is the only course. Remember Phillip Seymour Hoffman as typical. I’ll just point out we use computers in the voting process today (this is where trust comes in). Software to develop a map actually has no risk as once the map is created anyone can do the math and determine if the map generated is fair, competitive, and do peoples votes count. Unfortunately, when you do the math on the maps that we use today, it is clear Wisconsin’s elections are not fair, competitive, and quite frankly many votes simply do not count (it’s as if a group of people got together and planned it this way). @WCD – Let me take a stab at translating this: “No one will ever trust it” means “You will never trust it”, “will not happen” means “You don’t want it to happen”, “will never pass constitution” means “You don’t want to consider it so you’re throwing up a roadblock to further conversation”. If so, I understand. Using computers to draw districts would be a major change at a time when you don’t appear to have a lot of trust to spare. Wisconsin has become a laboratory/model for how to take over state government through gerrymandering and unlimited money from outside donors, finessed by politicians’ ability to coordinate all that dark money with impunity. People outside the state are starting to take notice. One can only hope that there are limits to how much corruption will be tolerated, but pendulums do swing. This approach to redestricting will inevitably be considered, if not first in Wisconsin, perhaps in states with cleaner government. Kevin Baas and company, keep up the good work! I hope that these metrics (or similar ones) become the basis of a court case (which should reach Supreme Court) challenging gerrymandered districts as an equal protection issue. Total wasted votes might be the simplest one to argue. By the time it gets there there will be new reapportionment. As I get ready to go see how our leaders, Hillary and Obama got our kids killed in Benghazi when they heroically went to save our ambassador, my three kids are all in special services, I can only say about this debate: “I love to hear the Left whine. they had three chances to toss out Scott and they failed so they just keep whining. Why don’t you just take your ball and go home. This will be a sad movie to watch, as I could imagine my kids in this situation in Benghazi. At lest we are finally getting to the truth through the lies of Obama and Hillary. @WCD – Would you like some cheese with that whine? Please stick to a single topic and consider answering the questions put to you. Better yet, stick to the thread topic and contribute. @Dave Reid – I’m less concerned about this specific case then setting the precedent of using objective measures to define and identify gerrymandering. A workable legal definition which passed muster with the Supreme Court would end this nonsense. @AProgrammer, agreed. My only concern with that, though, is if the Supreme Court uses a bad measure, that could be bad. And they’re not mathematicians, they’re justices. And a lot of the people on on both sides of the case aren’t going to be mathematicians, either. And even the ones that are, might makes some serious mistakes. Now there are a number of different proposed standards out there, and ALL of them detect the current Wisconsin Assembly gerrymander, so in this case it doesn’t much matter – it literally is a gerrymander by any measure. But if we’re going to pick what should be the definitive legal measure, we should make very sure that we did the math right. To that end, I’ve researched the proposed methods and analyzed them using objective criteria to determine which is the best one: http://autoredistrict.org/news_draft.php#measure Spoiler alert: If Auto-Redistrict didn’t use the best known measure, how long do you think it’d take before I changed it so that it did? From that, what might one conclude? @KevinBaas I understand your concern, our democratic process deserves the best standard possible, and I agree. Looking at the problem differently, that might not be as big an issue. To my mind, all we need is an objective way to choose between two competing maps. Say, the Court adopted the standard that all other things being equal the candidate map with the fewest wasted votes (insert favorite measurement algorithm here) must be chosen and required objective criteria, which could be challenged in court, for departing from that standard. Suppose that they further granted standing to anyone living in a state who wants to submit a map during the review period. Now, an obvious gerrymander would fail regardless of the measurement algorithm used as opponents need only provide a map with a better rating. Not that hard in WI. Well I agree on the general approach – having a justicable standard that anyone can use means we can do away with having to show “intent”, since the mere existence and availability of the standard demonstrates that anyone who made a gerrymandered map did so knowing how to draw one that was not gerrymandered, and not choosing to draw it that way. We should reserve having to show intent for remedies that are punitive or retributive. Simply replacing a bad map with a fairer one is neither punitive nor retributive; the person who drew the gerrymandered map is not harmed, any more than a bully is harmed by being prevented from punching someone in the face. So there’s no need to show intent, malice, or any of that. You just need to show that there’s a significantly better map. And so it should be used. Q.E.D. However, on the measures thing – depending on what measure you use you’ll get somewhat different results, so one measure might say map A is better and another might say map B is better. And some measures even change what they say if there’s a uniform partisan swing. So you need to find a measure that’s well-behaved and in an important way “the one you should use”, if other measures disagree with it. Also there may be more than one thing you need to measure. For instance, total wasted votes (if you count only overvotes (votes in excess of a majority), not undervotes (votes below a minority)), that measures overall competitiveness – it doesn’t measure if one party is stuck in less competitive districts than another. So you might need a few measures. Auto-Redistrict uses three: competitiveness, lack of partisan gerrymandering, and lack of racial gerrymandering. Now fortunately none of these things conflict – improving one tends to improve the other two. But nonetheless, when you say “map a is better than map b”, well to do that you have to give each of these three measures a different relative importance. Unless of course map a is better then map b on all 3 scores. It turns out to be really easy for a computer to make a map that beats a human-drawn map on all 3 scores by quite a substantial margin. But fast-forward to when a whole bunch of people are having computers make maps that optimize these criteria. It gets a little harder to pick between the results. However, when we get to that point, I think it’s fair to say that we’ve solved the problem of gerrymandering, cause any gerrymandered map would seriously fail against the computer maps. That’s presuming, of course, that people won’t still be using “communities of interest” and the Voting Rights Act to create a guise of legal justification for racial and partisan gerrymandering. That’s the other battle.